You'd recognize this orange-roofed condominium tower from most photos of Nanaimo's skyline or waterfront. The 26-storey tower is flanked by two 7-storey buildings, earning a crude nickname from some locals - but for most of us, the whole complex is simply "Cameron Island". (It hasn't actually been an island since Nanaimo's earliest days.) Construction was in the first half of the 1990s. This is a prime location on Nanaimo's popular seawall, directly beside Port Place Mall, the marina, and the rest of downtown. Each of the three buildings has its own strata. Pets are not allowed in the tower, but they may(?) be allowed in the smaller buildings. There is a cap on rentals. All owners enjoy secure underground parking and storage. See all Cameron Island listings at the bottom of this page. The tower building is called The Beacon; it has 120 units, an indoor swimming pool and hot tub, exercise room, clubhouse, and wheelchair access. 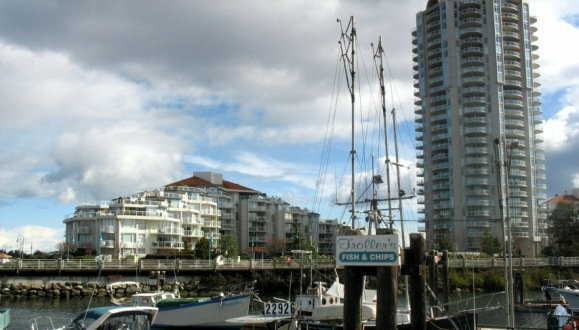 This is the northernmost building, closest to the marina but with north- and east-facing units having harbour views. Many units around 1085-1300 sqft, but there are penthouse-style "garden patio" suites in the 1850-1900sqft range. This building is nearest to the Gabriola ferry terminal. Many units have gorgeous south- and east-facing views of the harbour and the estuary, and the distant mountains including Mt Baker. The other units look across the pretty courtyard toward the marina and the city. Many units around 1150 sqft, but then there are penthouse-style "garden patio" suites in the 1850-1900sqft range.